Our package for you can start here. From an initial on site 'briefing' meeting we can undertake design and produce costs for your required works, from recovering a few stools to a major golf clubhouse refurbishment. We specialize in designing, building and installing bars and backfittings including the associated services of Electricians, Plumbers, Technical Services together with marketing advices and retail sales equipment. We can advise on colour schemes, wall and ceiling design and finishes, layout, flooring and furniture requirements incorporating some practical advices covering issues such as Health and Safety, Disabled Discrimination, Fire Safety Assessment, Planning and Building Control requirements. Lighting is one of the most important aspects of any scheme adding character and atmosphere or destroying the ambience if inexperience is let loose: our Designers excel in lighting schemes and on a number of occasions a new lighting scheme has saved planned redecoration costs. Whether your bars can be adapted and modified to suit changing customer needs, including re-polishing new tops etc or you require new bars in new layouts; you can be assured that our skilled craftsmen will produce an exceptional quality piece of furniture. 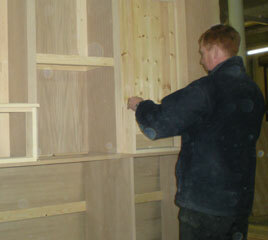 All our new bars and backfittings are manufactured in our Bootle factory. We specialize in solid hardwood tops; factory stained and polished any shade using the very best Acid Catalysed Lacquers. Our joinery shop also manufacture chairs, tables, stools, screens, fixed seating of various styles, darts and trophy cabinets along with any site specific feature joinery. Our Design Team have a wealth of experience producing a great variety of options to suit both your and your building needs. Whether you are looking for characteristics of acoustics, hygiene, humidity resistance or just aesthetically pleasing we can demonstrate the effect for you. Suspended grid ceilings are easy and fast to install they cover old cracked finishes, stained and damaged dry-lined ceilings. Lighting options are endless and our suspended ceilings crucially absorb and reduce noise. Our lighting schemes embrace contemporary, modern or traditional themes but all our schemes are personal to your requirements and needs. 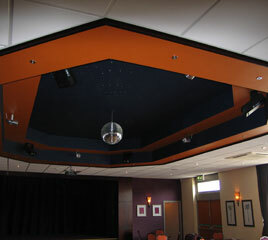 We can install sound to light music systems and air conditioning units built into any of our ceiling systems. Within our carpet workroom we can plan and sew seam up any contract Axminster or Wilton carpets to any size, which results in no unsightly stuck seams on site - finished carpets planned for your rooms with out waste. Our very experienced Floor Layers working in conjunction with our Design Team can offer solutions to projects, when time spent on site is of the essence. Thorough preparation is the key to successful 'Hard Floor' finishes - one area where we demand the necessary time from our clients. 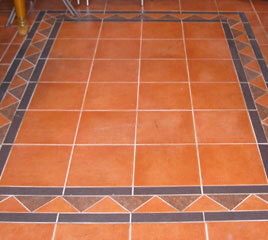 We specialize in hard flooring finishes of Marmoleum and Linos, Safety Floors and Decorative Vinyl's such as Karndean. Our Floor Layers work alongside our Joiners laying Timber Floors and with our Tilers laying Decorative Ceramics. 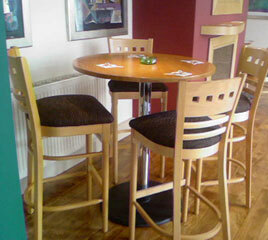 At Inn Design & Contracts Limited we manufacture several stock ranges of Tables, Chairs and Stools for the licensed trade. 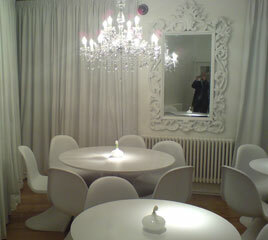 We also buy in frames 'in the white' for finishing by our expert Upholsterers and French Polishers. All of our frames are selected for their quality and a wide range of fabrics and leathers provide your exact finish requirements. Furniture recommendation is part of our Design Teams brief to our clients. We also manufacture purpose made fixed seating of many different styles and fabric/leather finishes. Our Design Team will be pleased to assist with any enquiries. We have our own French Polishing shop thus enabling us to produce quality finishes to the timberwork of our bars, loose furniture and feature joinery. 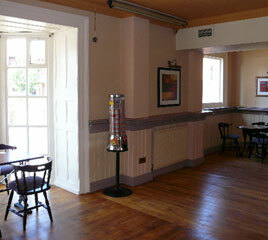 We can also prepare and repolish fitted on site furniture such as bars, backfittings, screens, doors etc. Working only under the supervision of our Design Team we are able to offer a complete internal/external decorating service to our produced schemes.